I was in the music business for a long time. I started as a clerk in the record department of Sattler's department store across from the Broadway Market in Buffalo, dropped out of college to work at the Buffalo One Stop, became the promotion guy for Best & Gold Distributors in Buffalo, then the local A&M guy, moved to Florida (still with A&M), and finally became an AOR indy. Then I returned to being a full-time fan, which is how I'd started out, spending my allowance on singles at record shops and department stores in Flatbush. I'm not a musician (as those who've heard my guitar playing will attest) but music flows through me like blood — a Beatles tune, a Miles Davis solo, a melody from a long forgotten jingle or something I heard on XM this morning — even when there's silence, the music plays. I just got a copy of Don Felder's no-doubt sour grapes Eagles memoir. My wife and mother read Barbara Walters' book and this is my equivalent. No excuses. It's schmutz, I'm certain. Gossip. Fun. A few years back, I reviewed Jimmy McDonough's biography of Neil Young, Shakey, as a business book. I laughed to myself for pulling a fast one but got my comeuppance in the form of a congratulatory note from Herald Executive Editor Tom Fiedler commending me for doing so. Damn! I got back at Tom by writing and directing him in a rap video a few years later. But that's another story. Here's the Shakey review, which also got picked up by Australia's Sydney Morning Herald. Wait a minute. 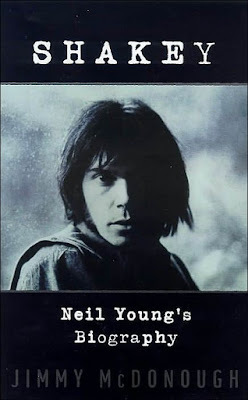 The biography of long-haired hippie rock-'n'-roll burnout Neil Young is a guide to good business? Of course. Young owns Lionel Trains (the company, not just a clutch of little locomotives) with a couple of partners. Also, he's had a remarkable career that serves as a solid case study in small-business and career development. As a business book, in fact, it's probably more valuable than recent autobiographies by Louis Gerstner, Sumner Redstone and Jack Welch. All over the world, young people struggle to succeed as professional musicians. Most fail, although "successful" ones are often relegated to performing Top 40 hits in bars (or bar mitzvahs). It's partly an artistic issue, of course, but mostly, it's a business challenge, involving sales, marketing, promotion, finance, human resources, productivity, technology, logistics and more. Jimmy McDonough's book Shakey: Neil Young's Biography ("Shakey" is one of Young's various nicknames) shows how a small, independent business person developed his skills and increased his marketability by creating a unique product and presenting it in a variety of packages. Neil Young might claim that he was not "a business dude", and that commercial success was the farthest thing from his mind. However, his relentlessness and single-mindedness belie this. And McDonough's book outlines his subject's career trajectory that could serve as a series of lessons from both creative and mercantile perspectives. Young, who has had a varied music career (to say the least), is tenacious and hardworking. He collaborates with a wide variety of partners, vendors and support staff to present his product (music and image) in a variety of packages destined for diverse audiences. When opportunities to expand into other markets appear, he evaluates them and proceeds cautiously, committing only to short-term projects that are subordinate to his main product. While many of his peers fade from the radar screen through failure, death or lack of hits (same difference), Young grows in stature. Most of his recordings remain in print — no mean feat in these days of record company consolidation. Young also owns several recording facilities, is an innovator in digital recording and an inventor of a number of technologies that led to his acquisition of Lionel Trains, as well as several devices enabling communication and transportation for the handicapped. Along with Willie Nelson, he founded Farm Aid, the charitable organisation that supports family farmers. He's also an active supporter of other organisations aiding disabled children and their families. McDonough spent more than a decade researching and writing this book. Originally, it was authorised by Young, who granted him access to nearly all the leading players of his life and work, and then sat for numerous interviews with the author. But by the time the book was ready to go, lawsuits shot back and forth between author and subject. When the dust (and suits) settled, the book was released. The author shares the copyright with Young, who retains all "ancillary" rights, meaning that if a movie or play were made from the book, Shakey could (and would) veto it. If you're a fan, Jimmy McDonough's absorbing and passionate study is a must-read. But it's also a terrific textbook for professional musicians and other independent entrepreneurs. Rust never sleeps, indeed!